Other scientists and scholars' introductions, in full length, as published in Ove von Spaeth's "The Enigmatic Son of Pharaoh's Daughter", VOLUME 2 of the book-series "Assassinating Moses". - In addition, the table of Contents of Vol. 2. This work by Ove von Spaeth reassesses Moses' historic situation, and - if properly published and put into circulation - it could alter our current view of this historic sequence of events in the Near East during the last half of the second millennium BC. Ove von Spaeth's work - the result of year-long efforts on partly unheeded problems up to now - not only constitutes serious historical research, but is a vivid historiography appealing both to scientific history research and ordinary readers interested in history. A treatise by Ove von Spaeth, documenting an exact dating of the oldest Egyptian star map - is described by BBC's Science editor, the British astronomer Dr Sir Patrick Moore, as "... a major advance". This special treatise was published in "Centaurus International Magazine of the History of Mathematics, Science and Technology" (vol. 42:3, July-August 2000, pp. 159-179) and is, by permission, published too in the Appendix of Volume 2, presented here in an easy to read form in a Danish translation. "... The resulting date of Senmut's star map, objectively proven by the author on an astronomical basis, adds, in my opinion, a considerable contribution to the debate concerning the Egyptian chronology. ..."
"Without any knowledge of astronomy I am nevertheless convinced that from Egyptology's point of view the paper by Ove von Spaeth contains new and valuable information concerning the date of Senmut's star map." Contents - of Vol. 2: "The Enigmatic Son of Pharaoh's Daughter"
Controversial archaeological find: entombment of Moses' wet nurse? Cosmic bad omen? - Fratricide in stand-in sacrifice? Name manipulation and destruction of images. - Was Moses' pharaoh-name stolen? Biblical Research: B.D., Royal National Library of Denmark, Copenhagen. Further thanks to: Rune Engelbreth Larsen, M.A. in History of Ideas and History of Religion; - Eva Björnböl, Research-librarian, Cairo; - Jannie Fursund, LLD, Assistant Professor; - Asmus Koefoed, Bach.Phys. ; - Karine Smidth, Journalist; - Bodil Eeg Neumann, Techn.A. ; - Sidney Maage, Principal, Ministry of Defence; - Raymond Bildstedfelt, Inf.Director, DI; - Marianne Illum, proofreader; - Evan Bogan, Publ. Director; - The staff of The Royal National Library of Denmark, and the staff of Dep. II of the Copenhagen University Library; - Construction of Computer Programs: Laurids Pedersen, Nysted, DK; - Cynthia Gyldenholm, Translator; - Ulla Hoff, H.D., English language, Translator; - Astronomical Computer Calculations: Jarl Hansen, Macro Systems Internet, Coín, Spain. Moses was outmanoeuvred by a well-planned ambush. Because of Moses' versatile brilliance and personality he would probably have become one the greatest pharaohs of Egypt - but another prince took power and systematically tried to destroy all traces of his rival. Yet the subsequent absence of clues has caused modern-day doubt and commotion about Moses' place in history. The book is the first to explore and develop the genuine Egyptian context with regard to Moses. Data from archaeology, Egyptian astronomical records, and ancient inscriptions as well as the Rabbinical Talmud texts show why the traditional concepts of Moses' identity and fate need to be critically revised and re-examined. The sources strongly indicate that Moses was a high-ranking leader among the Egyptian elite - and offers a master key to uncover a large-scale political intrigue at Pharaoh's court which led to Moses' exile. The "silent years" of Moses' life can now be revealed and heard. Key Phrases : historical Moses drama, ancient Egypt, archaeology, anthropology, history, ancient astronomy, the Moses identity, Prince of Egypt, high priests, magical spells, identity theft, iconoclasm, name manipulation, court conspiracy, ritual mock execution, royal substitute victim, star myths, astronomical dating, cultural history, ancient chronology, Bible, Rabbinical Writings, religious history, theology, the Old Testament, Torah, Pentateuch, Jethro, Exodus, Egyptology, Ove von Spaeth, Philo, Josephus, Pharaoh's Daughter, Queen Hatshepsut, royal infant ritual, Maatkare, Isis, Pharaoh Tuthmosis III, Thebes, Sirius, World-axis, mythologies, Sinai. In the Volume 2 in the series on the historical Moses the events take place at the golden era initiating when Pharaoh Tuthmosis I created the new Greater Egypt - and at the pharaonic court Moses was brought up to be a pharaoh later. This was the situation because he had a special status in connection with important circumstances at his birth - in a far more unusual way than hitherto assumed. The findings from Ove von Spaeth's thorough, detailed research demonstrate a new reality behind the antiquity traditions of Moses: originally an Egyptian Pharaoh Prince with whom everything finally went differently - because of the fact that Moses by a coup was expelled as a candidate for the throne, and after his mysterious disappearance his reputation became destroyed by enemies at court ... Later he unsuccessfully tried to regain the throne and eventually became a leader for the Hebrew immigrants now seeking new land. The powerful priesthood "removed" him as heir of the throne, he was made the great political scapegoat, and a genuine mock execution of him was carried through, and finally his name was ordered to disappear from the records, statues, etc. Today, our enlarged information basis making us able to know all this and on the basis of the ancient sources of the 'Rabbinical Writings', now Moses has become further identified as being the mightiest man in Egypt next to Pharaoh. Actually Moses held the post of deputy, i.e. the Pharaoh's substitute and was given also exactly all those high offices normally held by a crown prince/heir to the throne. - Why had Moses disappeared many years before the Exodus? - Has Moses' secret burial chambers in Egypt been found? - Which high-ranking Egyptian had an identity like Moses? - Did Moses know about history's oldest known star map? - Which documents mention how the execution of Moses was faked? The research presented in the book builds upon more recent archaeological findings, in conjunction with additional evidence from an array of sources.The contents present data from archaeology, and results by improved reliability of dating techniques achieved from Egyptian astronomical records, as well as historical information in ancient Rabbinical Talmud texts - among others - all of which strongly indicate that Moses was a high-ranking Egyptian from the 18th dynasty. The book offers a master key to uncover a large-scale political intrigue at Pharaoh’s court which led to Moses' exile from Egypt. The historical impact of this evidence is considerable and needs now to be taken into account. "The Enigmatic Son of Pharaoh's Daughter" sheds more light on the Assassination of Moses: - Was Moses a mythical figure, or did important elements of modern biblical research 'murder history'? - A discovery of controversial information has now revealed heretofore obscure evidence of Moses' historical existence and new facts to explain his dramatic fate. Precedents show that when the probable location of the ancient city of Troy was discovered by Schliemann on the basis of clues in Homer's ancient texts, his assertion was long regarded with suspicion by science and scholarship. This even though it was possible to substantiate the accounts - that were widely regarded as myths - with significant archaeological evidence to form a more tangible historical perspective. This same type of reservation has long been propounded against the Moses story. Assassinating Moses - carried out by his peers within the Egyptian opposition, and later on partly by Bible editors of ancient times - indeed seems to have been repeated in modern times by certain new schools of research that have made Moses a "fabricated mythical figure". But the presented study's thoroughly argued verification precisely demonstrates that a vast multitude of archaeological and textual hints, facts and evidence can be presented and are "far greater than necessary for winning a lawsuit". For example, data from the world's oldest star map and other more recent and older finds contribute to a new perspective and to improving uncertain dating techniques. By tracing, compiling and presenting exceptional knowledge from research, finds and archives, the author produces important documents. They harbour a historically astonishing Moses account, an account that has a different, more logical context than previously assumed. A well documented drama of reality. A drama in which the 'scapegoat' syndrome, officially used in a ritualized version, emerges in several historical circumstances. The unique material is made accessible in a form so it can be read without the need for scientific qualifications. The book provides for the first time an entire documentation from ancient sources and the material from archaeology presenting Moses as an Egyptian prince, actually that he was the son of Pharaoh's Daughter and as such intended to be Pharaoh. His mother, the true Pharaoh's Daughter, was the later Queen Hatshepsut - and the striking evidence indicates that she gave him birth in February 1534 BC. She is remarkable by managing to crown herself to be Pharaoh - obviously showing a strong attempt to protect the son's candidacy for the pharaoh title. The biblical character Jethro who became Moses' father-in-law, was according to indications in the 'Rabbinical Writings' a senior member of the royal family and holding the river-god title Iteru - he is the biblical Jethro. But Moses had a half-brother whom his (step)father, Pharaoh Tuthmosis II, had with a harem woman. The half-brother got Moses removed in order to make himself ruling, later under the name of Tuthmosis (III). However, this Hatshepsut's outmanoeuvered son is not any longer known or as being connected under the name of Moses. In the history of Egypt he is best known as being named Senmut or Senenmut (Egyptian for "the mother's brother") and seems to have been actually a polymath. Very early he achieves the high-level positions as a royal deputy and minister of finances and taxes, and even an army general. But he is also a brilliant architect - all of which the book has documented from investigations of the grandiose buildings as well as inside the tomb constructions which Senmut had made both for his mother (the queen) and for himself. (However, the other books of the series can be read independently of these discoveries and without perceiving Moses being in the described role of a crown prince). The considerable number of clues from the writers of antiquity and the greatly enhanced knowledge of the archaeological findings significantly contributes to identify whom in ancient Egypt could be the person who since became known as Moses. As will be seen, a brilliantly intelligent person who's position was sabotaged by envious persons - among which a very clever competitor, but the groups apparently also counting a number of mediocrities - a problem well-known through history. 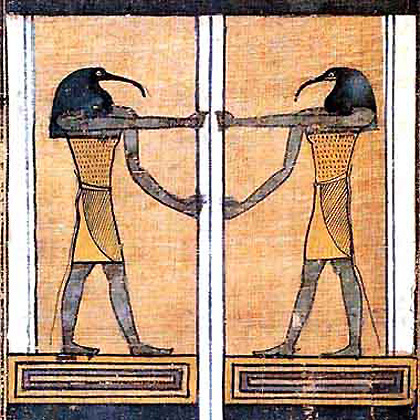 The reader is presented with an extensive series of specific parallels between Senmut and Moses, which directly indicates that it could be one and the same person. The most conspicuous point is that they disappear from Egyptian history at the very same time. What happened? When the priesthood established a plot they found a useful tool in the later Tuthmosis III who according to his inscriptions had been a priest before he made his entry to the historical arena. Many interesting traces point to the presence of a special ritual for royal infants, all of which just seems fitting the case that the infant prince, Moses, had come floating on the river, then to be placed in the care of a wet nurse at court. And actually, the one who seems to have been Senmut/Moses' nurse was found as a mummy by Egyptologists in 1936! Husband and wife were buried as royal foster parents. In Senmut/Moses' own tomb a valuable star map is found installed, it is unique in its specification of the celestial bodies' arrangement, which directly leads to confirm also the date on which Moses was born, all in accordance to Rabbinic ancient texts of knowledge traditions. Queen Hatshepsut who proclaimed herself Pharaoh followed, in 1493 BC, the Hep Sed Festival tradition as the Egyptian kings used to do by celebrating this so-called renewal anniversary. The hostility of the priesthood culminated here. Moses, now almost at the age of 40, was accused of murder. A brief version of this intrigue is mentioned in the Bible (Exodus 2:11-14). However, the 'Rabbinical Writings' show a fully prepared situation, a regular frame-up by which two Hebrew men trapped Moses and testified against him. First, both Moses' nurse and foster-father are eradicated; and then the situation also hits Moses. According to the Bible, Moses had to flee because of the apparent death of an Egyptian 'slave bailiff' - it was the mentioned, arranged trap and in Egypt there was death penalty for attacking a person who - according to indications in the 'Rabbinical Writings' - was also pharaoh's herald. But the assassination appears as fictitious; and so does the ritual execution of Moses. Behind the events all this is naturally connected with the rituals mainly dealing with the "king renewal magic through substitute victim". Moses had, thus, in worst case to be presented as substitute-sacrificed so that the king - the new Pharaoh Tuthmosis III - could appear renewed, full of vigour. The ritual is strengthened by also by being linked with the ritual fratricide with references to both Cain-Abel and Osiris-Seth. However, Moses' precautionary measures against being killed had instead resulted in a symbolic execution. Here he lost his high-ranking posts and was in fact banned. This should hinder him from trying to resume of his candidacy to the throne. He had to escape from Egypt immediately as outlawed, and his official identity as a prince, the Son of Pharaoh's Daughter, and candidate to the throne was destroyed as a consequence of the symbolic execution and its attached magic curse. All traces of him were also to be deleted. Senmut/Moses is then fleeing - but not initially directly to the north as the impression the Bible may offer. So, he did not immediately go to the Sinai but - according to the 'Rabbinical Writings' - he escaped to Ethiopia/Nubia (Sudan) first. By this he avoided the new pharaoh Pharaoh Tuthmosis (III)'s persecution expedition at Sinai. In the south of Egypt he performed other heroic deeds, while the same Tuthmosis was looking for him in the north. And then the iconoclastic riot takes place: statues crushed - especially those depicting Senmut, but then many of Hatshepsut - inscriptions are cut off and re-texted now when Tuthmosis (III) had replaced the excluded prince, Moses. Hatshepsut's powers were partly taken over by young Tuthmosis III who was Moses' "half-brother". Eventually - by a historically well-known coup in 1488/1487 BC - this new Pharaoh seized the complete power from Hatshepsut, who was also his father's sister, his mother-in-law, as well as his pro forma step-mother. She died at some time later under strange and still unexplained circumstances. How will an acceptable identification of Moses as a historical person be? After the long life and the death of the real Moses, the long aftermath of his enormous efforts resulted in his transformation among the later Jews to a heroic figure suitable for their ideal. From this projection he later became a cliché among church theologians – and again, later by present researchers he has been re-defined to fit into a further alienated perception: in this was the historical Moses became a “literary” Moses and eventually a non-existing Moses – according to certain ideas. The brilliant person was displaced from Egypt, when he was 40, - and as much as possible were destroyed of everything reminding of him: names, pictures, records. All in a conspicuously, extensive amount. Information about him which only survived in the Bible, is insufficient to disclose his Egyptian background. He had really disappeared, and his identity had been destroyed to his surroundings as if the magic curse of the symbolic execution had come true. This dramatic change seems to have been the very turning point in his life as well as in his condition - and became a new starting point for his later deeds regarding the Israelites' exodus from Egypt. The extensive and exiting material collected in the book makes it perfectly clear that point after point of the biblical Moses narrative and its closely connected texts in the 'Rabbinical Writings' prove more plausible than previously to be considered possible. In particular this is striking when the 'Rabbinical Writings' and ancient writers' information about Moses are being analyzed and evaluated together with finds and results from archaeology and Egyptology. In addition astronomical dating based on information incorporated in the oldest Egyptian star map even demonstrates the chronology to fit exactly in accordance with Jewish sources. - More about the contents: Information points concerning this Volume 2 of the series "Assassinating Moses"
6 OVE VON SPAETH: INTRODUCTION, VOL.2's APPENDIX "SENMUTS' STAR MAP - DATED BY ASTRONOMY"
- concerning the Vol. 2's Appendix on "Senmuts' Star Map Dated By Modern Astronomy" (supplying chapter 4). Documentation of the dating of Senmut's star map. The scientific treatise by Ove von Spaeth published in "Centaurus" (Vol.42;3, 2000, pp. 159-179) was later re-edited to be used by readers without "professional" astronomical knowledge. This to be presented in connection with Ove von Spaeth's Moses-research - then being added as a special Appendix to vol. 2 of his present book-series on Moses. From a hitherto unknown level of the astronomical knowledge by ancient Egyptians, in a high-level era of 1550-1450 BC, an opportunity now turns out concerning the ability of discovering new and surprising information contained in Egypt's oldest star map. The star map in question constitutes the adornment of a tomb construction which belonged to the grand vizier and calendar chief of Queen Hatshepsut, approx. 3,500 years ago, under the 18th dynasty. Also, it is the world's oldest star map. "The study concludes as follows: The Senmut map depicts an exceptional event in the sky. This seems to have produced a prototype for all later pictures of similar celestial events - but with one exception: In the first depiction, in the time of Senmut, Mars is retrograde in the west when the other planets assemble around Sirius in the east. So far has been demonstrated: 1) The Senmut maps contain a cosmological and astro-mythological expression not only as decoration - as hitherto assumed - but also as a picture of a particular and unique situation in the sky. - 2) This configuration of the sky can be exactly dated: 1534 BC. In addition the star maps may contribute to a much better dating of their creator Senmut and also of the contemporary Egyptian pharaohs." b) the very discovery that other star maps, too, e.g. by Ramses II, are constructed according to similar systems containing information reflecting their exact dating. As an extra gain the especially important era of ancient history (Egypt's 18th dynasty period) is now to be set free of the limbo of non-fixation of its exact time. - Erik Iversen, Dr.Phil.h.c., Egyptology, formerly of the University of Copenhagen.